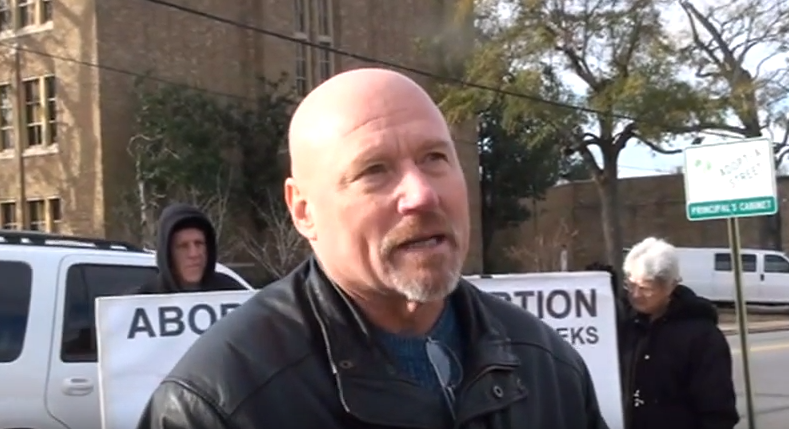 Rusty Thomas, the head of the radical anti-choice, anti-LGBTQ, anti-Muslim group Operation Save America claimed to have extensive contacts in the Kentucky state government in a speech to his group when it was gathered in Louisville this summer to protest in front of the state’s last abortion clinic. Thomas said in the July 22 speech, which OSA recently posted to its YouTube channel, that as he was considering bringing OSA to Kentucky for its national event, he went to Wisconsin to visit Matt Trewhella, an OSA-affiliated activist who has said that the murder of abortion providers is justifiable homicide and who has in recent years been attempting to convince government officials that they must “interpose” against federal laws on issues such as abortion rights and LGBTQ equality. “He orders 2,000 books and he spreads it in the church world and throughout the state government, the government of Kentucky,” Thomas said. Thomas had previously said that the group was getting help “establishing our comings and goings” in Kentucky from “a congressman who is a dear Christian brother who is serious about restoring his state in righteousness.” Thomas did not specify if he was referring to a U.S. congressman or a state legislator.